Gary works as a set and costume designer for opera, musicals, and theatre productions. Originally from Northern Ireland, he is now based in Greenwich, London. His designs have been produced on Broadway, in the West End, at the National Theatre, and at major opera houses all over the world. His work will be on display this summer at the V&A museum as part of the MAKE/BELIEVE exhibition, and his art installations in 18th century follies can be seen at Fountains Abbey in Yorkshire until November. He recently designed the 50th anniversary tour of The Sound of Music, which is currently on tour in the UK. 'Theatre designers are true magpies, our eyes are trained to focus in on small, significant aspects of the world that no-one else may notice - I never feel I'm truly "off duty" and am constantly absorbing the environment and people around me for inspiration. 'I spend an enormous amount of my time obsessing over little details - the patina of a button, the exact length of a hem, the colour of thread on some topstitching, pattern-matching, finding the perfect fabric or vintage accessory. Every detail works cumulatively, fleshing out the universe I am creating for the audience, this greatly assists the performers in generating their characterisations. Yours truly with some of the costumes I designed for The Barber of Seville in the Netherlands in 2013. The look combined eighteenth century details with modern fashions, and as the opera had a tonsorial subject matter everyone had marvellous, rather ridiculous wigs which were painstakingly hand-made and dyed to the correct colour before styling. 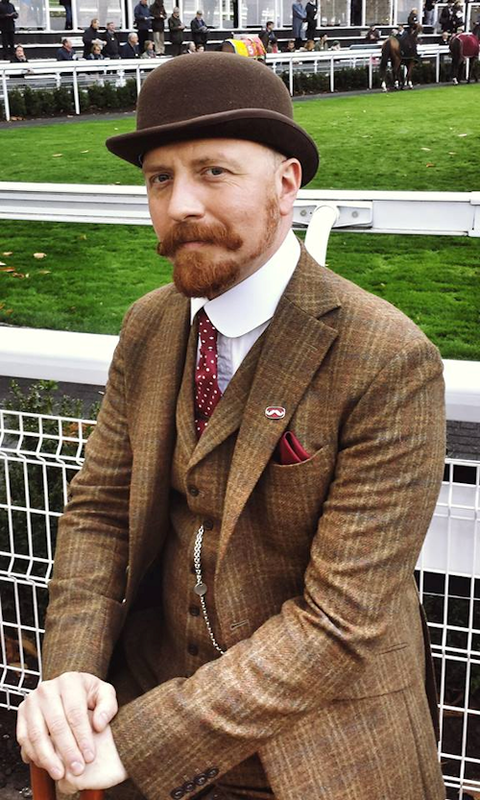 A day at Sandown races. Being a "friend" (ex-member due to beard growth) of the Handlebar Club, there are lots of opportunities for dressing up with like-minded folk. 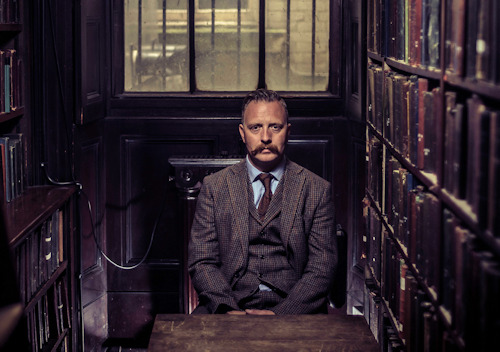 Some publicity shots I had taken in Newcastle's Literary and Philosophical Society building by the photographer Topher McGrillis. The suit is from Walker Slater in Edinburgh. Finally, ever generous Gary offers some tips for achieving that 'Gary look'. Fantastic, robust vintage-style jeans made by prisoners. Based in the United Arab Emirates, they ship globally. Communication is very good and delivery is surprisingly fast. Most recently I bought a reproduction RAF Irvin sheepskin jacket from them and was thrilled with it when it arrived.